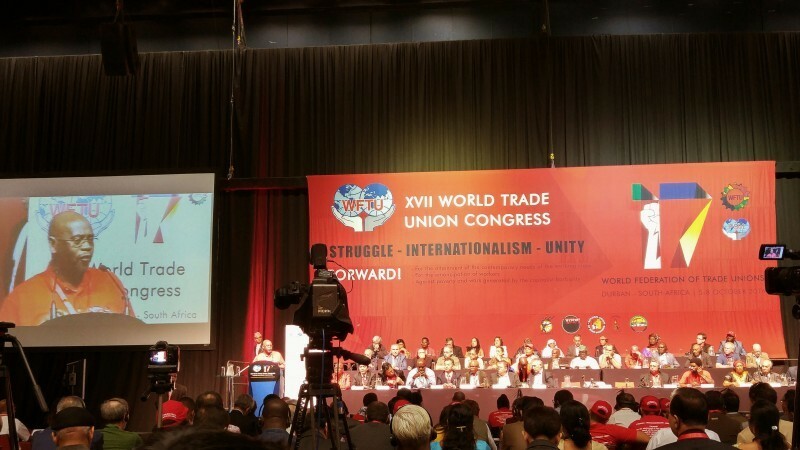 World Federation of Trade Unions 17th Congress underway in South Africa | Fight Back! Durban, South Africa - 1500 delegates from class-struggle unions from over 110 countries gathered in Durban, South Africa on Oct. 5 to begin the 17th Congress of the World Federation of Trade Unions (WFTU). The WFTU represents 92 million workers in 125 countries. The gathering is hosted by the Congress of South African Trade Unions (COSATU), the historic trade union federation that helped lead the fight to defeat apartheid. Delegates were welcomed by COSATU president Sdumo Dlamini, WFTU Secretary General George Mavrikos, and then were received with a speech by the president of South Africa, Jacob Zuma. There were speakers in several languages from unions leading important, large struggles around the world, including India, Brazil, France, Indonesia, Chile, Ecuador, Lebanon and many more. Union leaders from socialist countries China, Vietnam and Democratic People’s Republic of Korea also spoke to delegates. Speaker after speaker paid homage to the historic anti-apartheid struggle of the workers and people of South Africa. Delegates from African countries particularly expressed the importance of having this world Congress in Africa and particularly in South Africa, with its long history of struggles for national liberation and working class emancipation. The hundreds of COSATU members present brought the spirit of their struggle to the Congress, frequently leading the group in songs and chants from the South African anti-apartheid and workers’ struggles. The Congress will meet for two more days, with speakers from many more countries, leadership elections, resolutions and cultural events.